Do you know a child who has a feeding tube? Lovingly known as “tubies” by feeding tube families, it’s actually quite common to encounter a child with a feeding tube. In fact, there are over 500,000 people in the U.S. with feeding tubes, and approximately 20% of them are children. 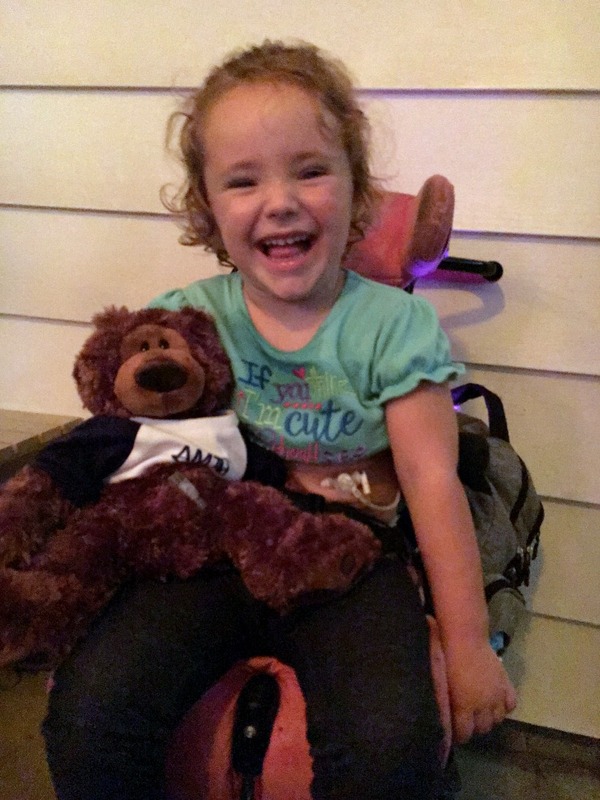 In honor of Feeding Tube Awareness Week, I am going to introduce you to my tubie daughter, Emmy, and then I’m going to share some myths we’ve encountered as people learn about Emmy’s pediatric feeding tube. Emmy received a gastronomy tube, or G-tube, at a young 2 months old, and it has helped her thrive in ways I would have never imagined. She does battle other medical problems, but her G-tube does not change who she is or make her life harder. In fact, her feeding tube has been a life saver. The recommendation for Emmy to get a G-tube was made due to severe reflux that caused her such bad pain she refused to eat. This led to oral aversion and a sensory-related feeding disorder. She was not able to latch, so I pumped breastmilk. It would take over an hour to get just one ounce of breastmilk in her little belly, and she needed at least 24 ounces of milk per day. So, you can envision the continuous cycle we were in as parents. Not to mention we also had her twin sister who needed to be fed, as well. At first, my husband and I were scared. We had never even considered the thought that we’d have a child who would need a feeding tube. We worried about the pain it may cause her, the extra work it would create, the restrictions it would place upon her, and what other people would think about it. I’m not going to lie — when we were making the decision to place the G-tube, I cried. I lost sleep. I questioned over and over whether we were making the right choice. Emmy was only two months old, and it didn’t feel right. I was heartbroken. I wanted so badly just to nurse her, or feed her like a ‘normal’ baby. In a way, I felt like we were giving up on Emmy, or choosing not to work hard enough. But I can tell you, the day we came home and I was able to nourish her with my breastmilk through her tube without having to watch her gag and cry in pain, I knew we made the right decision. The feeding tube enabled us to provide her with the nutrition she needed, no matter how it may look on the outside. And while it seemed so difficult at the time, I have never regretted the decision to get my daughter a G-tube. It’s hard to hide the look of curiosity a person has when they see a child with a G-tube. I’m used to seeing that look. At first it made me feel uncomfortable to see those reactions, but as I became more comfortable with her tube myself, I realized that it’s okay to be curious. I didn’t want people to be afraid to ask me about Emmy’s G-tube. Creating awareness about feeding tubes is one of the first steps in normalizing its presence. There are many reasons a child may need a feeding tube. Some have multiple health problems, but there are also many kids who both require a feeding tube and are typical, active children. When it comes to children with feeding tubes, many people don’t know what to ask or what to think. Today I’m going to put to rest some of the myths I often hear as a parent of a tubie child. This is not always true. Many children who have G-tubes actually love to eat, but are simply not capable of consuming their entire day’s worth of needed calories orally. So, the tube is used only to supplement some extra nutrition, often at night. The tube in no way restricts the normal function of ingesting food the ‘regular’ way. While some children with severe food allergies can only have special hypoallergenic formula through their tube, this is typically not the norm. Nutrition can take many forms…breastmilk, formula, or even real foods. I am a huge advocate of giving real foods to tubies when possible. Most children with feeding tubes have otherwise normal digestion and can tolerate finely blended foods through their tube. We have done this with our daughter for the past two years and have loved watching her thrive on this nutrition plan. Feeding tubes typically don’t cause pain or ‘change’ the child. They simply offer an alternate route to nutrition. Although some children will get sore spots near the tube’s insertion site, many barely remember it’s there once they become accustomed to having it. While the tube itself my look or feel permanent, they are actually fairly easy to remove in most cases. Some kids only need their tube for a short while. For example, following a major surgery. Others rely on their ‘tubie’ long term like my daughter. Emmy’s not ashamed of her tube — that’s never even occurred to her. It’s just a part of who she is. Are parents happy when their child no longer needs it? Of course, but in the meantime, I am so grateful for the ability to provide my child with the nutrition she needs. I often hear people tell me “It must be scary for you to see your child with the tube.” It’s actually not scary at all! It was much more scary to see how sick she was without it. Once we learned how to use it, we adapted quickly. The only real restriction we have is “try not to pull it out.” And if it comes out, it’s honestly quite easy to put it back in. Otherwise, our little one goes to school, swims, plays at the playground, and goes to the beach. She does pretty much all the same things her twin sister does. I once had a woman look at my daughter’s feeding tube and tell me, “it must be hard for you to see your daughter sick so much.” The truth is, Emmy was having a totally normal day. While people may assume that a feeding tube equals severe illness, many children with feeding tubes are otherwise healthy. 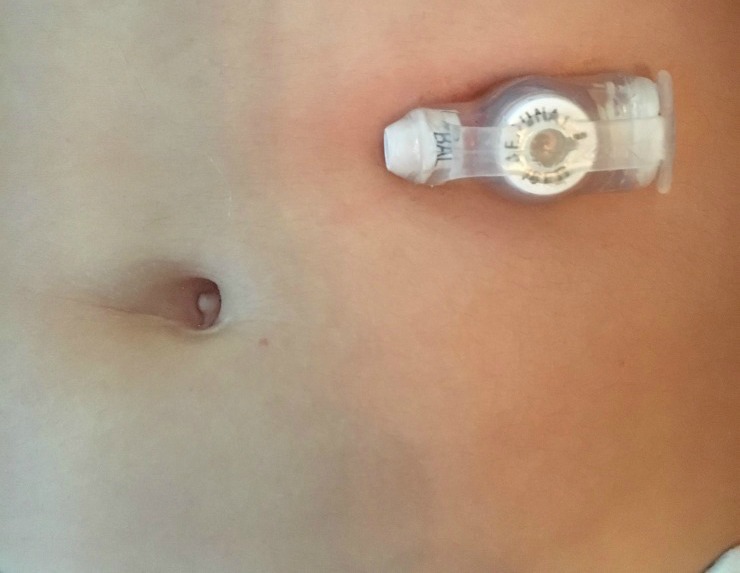 The G-tube is actually a huge asset when my daughter gets sick with common kid illnesses. Most kids refuse to eat and drink when they are sick. At least I have a reliable way to keep her hydrated when she doesn’t feel like drinking orally. When I entered practice as a Pediatric Nurse Practitioner, this is how I felt. I had a big book in my hand and I thought, “I’ve got this. I know how to handle a child with a feeding tube.” And then I became a parent to a tubie and found out that, boy, was I wrong. Honestly, every child is different, and therefore every tubie is different. I feel like I have learned at least one new trick from every tubie parent I’ve met. As a medical provider, this is especially helpful. Not all medical providers live in the presence of a feeding tube every day, so it’s helpful for parents of tubies to share their tips and tricks that we can then share with new tubie parents who visit our practice. I wish I had a dollar for every time I’ve heard this one. It’s probably one of the most frustrating arguments I encounter as a tubie parent. I’ll admit, we tried this approach a few times. But there are many reasons this is just not feasible. In my daughter’s case, it’s globally weak muscles. For other kids, it may be a sensory disorder. Regardless of the cause, there is no reason to deny your child the nutrition they need and deserve. It may look different on the outside, but fed is best! It’s a challenge to learn how to use the feeding tube at first, but when I compare my tubie to her twin, the tube is no more work than convincing a strong willed 3-year old to eat her vegetables. As my daughter gets older, we have found the fun in feeding tubes. She loves to help push her medicine syringes to give her own meds and help prepare her food. And she’s learning a lot about nutrition in the process. Win-win! While we encounter these misconceptions daily, I know that most people mean well. They have honest concerns and often want to help, and I’m glad to have the opportunity to answer their questions or teach them something they didn’t know about feeding tubes, especially during feeding tube awareness week. The most important thing I want everyone to know about my daughter is that the feeding tube does not define her. She is still our Emmy, a happy and wild (in a good way) 3-year old. She goes to school and has friends. She loves princesses, dressing up, and her twin sister. In most ways, she is an average kid who just happens to have a G-tube to help her get the nutrition she needs every day. Do you have questions about pediatric feeding tubes? Leave them in the comments, so I can answer them! Megan Lapinskas is a Pediatric Nurse Practitioner, wife, and mother of twins. She has been a pediatric nurse for 11 years and a PNP for 7 years. She specializes in pediatric development, feeding tubes, and treating children with special needs. 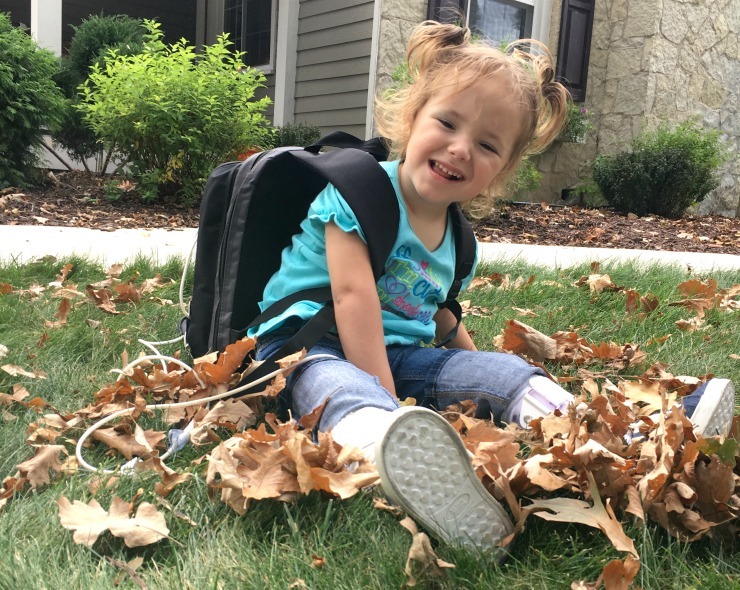 Her love for treating the special needs community continues to grow as she cares for her daughter with Cerebral Palsy, feeding tube dependence, seizures, and dysautonomia.